Ms. Lucia Theny is presently working towards her Master's degree, specializing in structural geology at Simon Fraser University under the supervision of Dan Gibson. Ms. Theny graduated with honours from the University of British Colombia Okanagan. Her honours thesis looked at the geochemistry and age of a Ni-Co-Cu project in Yemen. 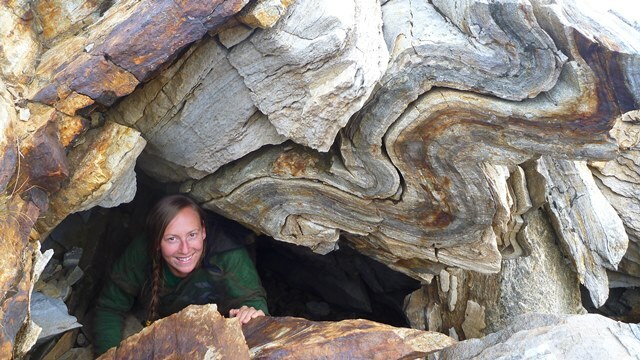 Her current project ties many of her research interests including structural geology, economic geology, and geochronology. Prior to her Master's program, Lucia was hired by a group of junior mining companies, where she had the opportunity do exploration work on several different deposit types throughout British Columbia, the Yukon, and Mexico. Project: Structural, Geochronological and Petrographic Analysis of the Ruddock Creek Zn-Pb deposit, Northern Monashee Mountains, British Columbia. The study area for this project is located at the Ruddock Creek Property of Imperial Metals Inc., which is situated within the northern Monashee Mountains. Structurally, the Ruddock Creek property is interpreted to reside within the base of the Selkirk allochthon, in the immediate hanging wall of the Monashee décollement. The region has undergone polyphase deformation that complexly folded the rocks (Fyles, 1970; Scammell, 1993; Höy, 2001). At the Ruddock Creek property, Fyles (1970) defined three phases of deformation. Rifted horst and graben topography along the western Laurentian margin controlled the sedimentary facies and the potential formation of sedimentary exhalative (sedex) deposits (Goodfellow and Lydon, 2007). Throughout the Canadian Cordillera, the temporal and spatial distribution of sedex deposits defines major metallogenic periods that are associated with rifting along the Laurentian margin (MacIntyre, 1991). A major metallogenic event is associated with continued Early to Middle Cambrian rifting of the margin that resulted in a series of uplifted and topographically higher sections that were capped by platformal sedimentary rocks. The Kootenay terrane and Monashee complex host shallow water carbonates and interbedded clastic rocks that underlie the strataform lead-zinc deposits of the Kootenay Arc, Shuswap and Adams Plateau (MacIntyre, 1991). During the Neoproterozoic the margin of Laurentia had discrete basins along its length (Lund, 2008). Basin development is the first fundamental step towards creating a sedex deposit. Reactivation of faults along the irregular horst and graben topography provided a conduit for the auriferous hydrothermal fluids which are syn-genetic with sediments (McMechan, 2012). Underlying magmatism provides the essential energy to drive the entire process of forming a sedex. The Ruddock Creek zinc-lead deposit is hosted within a succession of platformal rocks within the Selkirk allochthon north of the Monashee complex. The age of the rocks that host the deposit is not well known. The current resource at the Ruddock Creek deposit is 10,036,000 tonnes of 8.07% combined zinc and lead (indicated and inferred resource at 4% cut off). The deposit is interpreted to be a sedex deposit (Simpson and Miller-Tait, 2012). The earliest exploration and mapping of the Ruddock Creek property was done in the 1960’s and 1970’s by Cominco, Falconbridge and Doublestar. Ruddock was acquired by Selkirk Metals in 2005. Since those early days, Ruddock has seen over 88,000 metres of drilling, the development of an underground decline, support roadways and a substantial camp built on site. In 2012, Ruddock Creek Mining Company invested in a bulk sample, which was taken from the deposit’s main zone, the E zone. Research focus will be placed on (1) constraining the of deposit formation, (2) refining the Ruddock Creek property structural history through mapping at 1:10 000 scale, and (3) relating the deposit to the metallogenic evolution of the Cordillera.